SHELBY — Trevor Tallman, a 2018 Lexington and Pioneer Career and Technology Center graduate, has always liked school buses. He was a member of Darin Beal’s Industrial Diesel Program at PCTC for the past two years. Tallman described his instructor, Beal as one who was always there for his students, was always in class early and was willing to stay late to help a student. He was impressed with Beal’s work ethics. 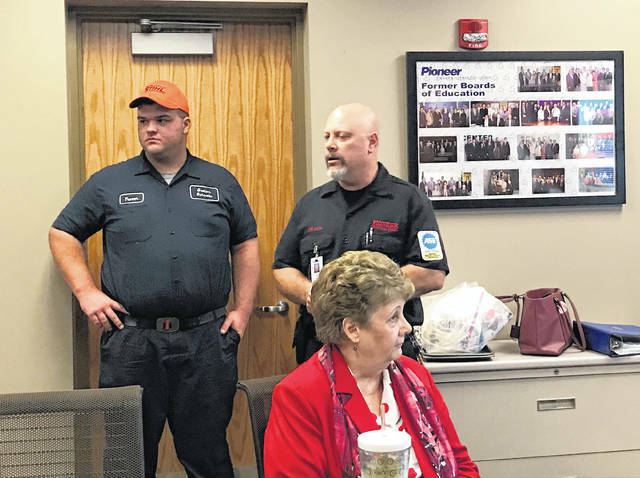 Beal was impressed with Tallman’s work ethics and hired him the summer between Tallman’s junior and senior year of school to work on the PCTC fleet of school busses. Tallman loved the job. Tallman won the local class contest for SKILLS USA and went to state competition where he won second place in the state of Ohio. During his high school career he was nominated Outstanding Student Achievement at Mid-Ohio, and was a leader in the classroom. During his senior year through early job placement, Tallman was hired at Mansfield Truck Sales & Service. He had a family crisis and unfortunately had to drive from Akron to school and work each day. He stated it was a hardship, but well worth it. He enjoyed his job, but was thrilled when recently Galion City Schools had an opening in their Bus Maintenance Department. Tallman now lives in Galion and is following his personal goal of working on school busses. He attributes his success to Mr. Beal and Pioneer. Mr. Beal was complimented by the board for his hard work with his students and his job as a mentor. Beal stated each student must take a diesel engine (that is in working condition) apart and put it back together in order to pass the class. He also teaches industrial safety with working with the engines. Accidents can happen so easily and it is better to be on the safe side. Beal stated when he graduated, jobs were hard to find. Currently, he receives calls constantly from employers looking for employees like Tallman. PCTC works with numerous companies in the area such as: Ohio Cat, Dutchmaid, Kokosing, Valley Transportation, Huntsman Trucking, and Ohio Ag Equipment. Ohio Ag Equipment offers to pay 100 percent of college tuition for its employees. If you are interested in diesel mechanics and decide to go to Pioneer, work hard, and enjoy the work, it is a win-win situation! Courtesy photo Pioneer Career and Technology Center instructor Darin Beal and former student Trevor Tallman have been working together. In the end. Tallman was hired as a bus garage attending at Galion City Schools. https://www.galioninquirer.com/wp-content/uploads/sites/38/2018/09/web1_Darin-Beal-Instructor-with-Trevor-Tallman-alumni.jpgCourtesy photo Pioneer Career and Technology Center instructor Darin Beal and former student Trevor Tallman have been working together. In the end. Tallman was hired as a bus garage attending at Galion City Schools.